GMC's redesigned Terrain, especially in the Denali trim, shows off a number of luxury-level upgrades, but the changes come with a price. 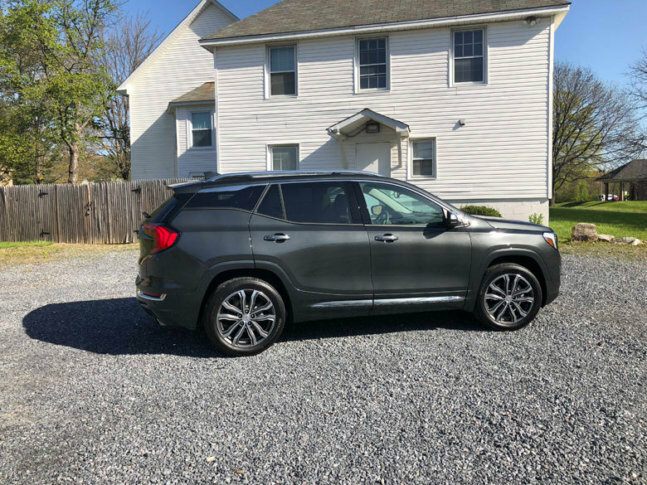 WASHINGTON — The redesigned GMC Terrain Denali AWD is a big improvement at a high price. It’s been a long time coming for GM. Just like their larger midsize three-row crossovers that were redone, the compact crossovers get that same overhaul. While the old Terrain offered lots of space, it lacked in refinement and the interior and technology seemed dated. That said, GM went to the drawing board and came up with a new Terrain that’s gone on a diet and has a fresh new look. But does it work? After a week with a top-the-line Terrain Denali AWD version, the answer is yes, but for a price of about $44,000. For that, you get the famed Denali trim level that ups the luxury inside with improved interior. The vehicle moves closer to a premium offering in the compact crossover class. Heated and ventilated perforated leather seats up front provide good support for longer trips with plenty of adjustments to get the right fit. Those sitting in the back seat have heat, but lose a bit of headroom when you choose the very large $1,495 Skyscape sunroof. Overall, it’s a pleasant, airy interior with good space. It seems that the new Terrain doesn’t have as large of a cargo area as before, and now it’s more in line with the competition. The rear seat folds flat, making cargo hauling a bit easier. What struck me is the improved looking and feeling materials used throughout the cabin. Most of the controls are easy to find and use, but the transmission is different, with the use of push-buttons on the dash. It takes some getting used to because of the location below the climate controls. GMC differentiates the Terrain from Chevy’s similar version by making it look more brutish and less car-like. The Denali trim is even more macho, adding a more truck-like chrome grill. The Denali’s special LED lighting and larger 19-inch wheels are also part of the package. The body isn’t as boxy as the outgoing model, so there are some nice flowing lines, and the rear windows taper up, ending with slender pieces of glass at the rear cargo area. There is some chrome and brighter trim pieces on the body, but the shiny trim isn’t overdone this time around. The more interesting style continues on the back of the Terrain Denali with dual exhaust pipes, and a cool-looking rear taillight housing that seems to add depth without looking generic and bland. The new Terrain is also better to drive. It’s a bit smaller and weighs less than before. You feel more confident when driving, particularly around curves. The larger wheels, however, cause a bit more upset over bigger bumps. The Terrain Denali only comes with the larger 2.0 liter turbo four-cylinder engine, and it proves to be a good match, providing plenty muscle to motivate the compact crossover. Optional AWD can be left in FWD mode when it’s not needed, and mileage improves a bit that way. I managed 24.5 mpg, better than the 23 mpg on the sticker. A new nine-speed transmission quickly shifts to the highest gear possible for better fuel economy, but it’s very smooth in its operation. The new Terrain is more hushed on the road when compared to the old Terrain, with less wind noise on the highway. It’s much more pleasant on longer trips. But the stylish body leads to slightly reduced sight lines out the back window. Luckily, the rear camera comes standard, which helps in tight spaces. Drivers will notice more tech available including Adaptive Cruise, Low-Speed Auto Braking, Lane Keep Assist and Warning, and other useful features for a reasonable $745 upcharge. The new GMC Terrain is a big improvement, and it should be back on the list for compact crossover shoppers. The Terrain Denali raises the bar for a premium crossover with more luxury and technology while coming in a more modern and competitive package.